Pioneers in the industry, we offer high pressure piston compressors and 20 hp high pressure compressor from India. The high pressure range of compressors is suitable for usage in the range of 30-40 bar for applications like engine starting, circuit breakers and marine applications. 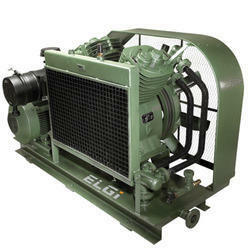 ELGi, established in 1960, designs and manufactures a wide range of air compressors. The company has gained its reputation for design and manufacture of screw compressors through strategic partnerships and continuous research and development.Over the years, it has emerged as a multi-product,multi-market enterprise providing total compressed air solutions in all segments. ELGi’s design capabilities translated into a wide range of products ranging from oil-lubricated and oil-free rotary screw compressors,reciprocating compressors and centrifugal compressors. ELGi has its own manufacturing operations in India, Italy and USA with subsidiaries in Australia, Brazil, UAE and Indonesia. The company is fast expanding its global footprint attracting distributors and customers with its latest generation products. ELGi is one of the few companies in the world capable of designing, manufacturing airends and compressor packages. The ELGi range of air compressors is one of the widest in the world.We manufacture reciprocating air compressors, rotary screw air compressors, oil-flooded, oil-free and centrifugal air compressors, and precision engineered components. Screw compression elements are manufactured in-house using state-of-the-art machining centers for rotor grinding and machining intrinsic castings of various sizes. 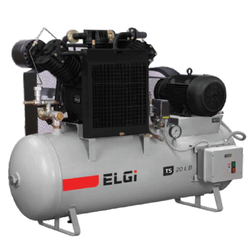 True to the leadership position it aspires, ELGi has through the decades maintained a technological edge in the air compressor market with incremental and breakthrough innovation, through incorporation of latest technologies in its products. ELGi is known in the industry for providing custom-engineered solutions to meet our clients’ needs.The company collaborates with clients to understand their changing needs and designs solutions accordingly.Long-term partnering has been our key differentiating factor. ELGi’s exclusive PET compressor range is ideally suited for PET blowing application which operate with one or more PET blowing machines. These compressors are specifically designed to meet the requirements of the PET industry and offers a low cost of ownership and very high UPTIME. The compressors are designed for operator and plant safety with OSHA standards with twin sided belt guard,sealed safety valves as the compressors operate at higher pressures. ELGi offers these compressors with a host of ELGi ‘Airmate’ downstream accessories such as Pre and after filters,oil and moisture separators,refrigerant dryers and vertical air receivers designed to ASME standards. Choose from ELGi’s wide range of high pressure compressors which are designed to precisely meet your high pressure Air demands. ELGi’s high pressure compressors are used widely in different applications such as PET blowing,Plastic and Packaging Industry,Genset starting,Circuit breaking,Power plants and Testing labs. 20 HP High Pressure Compressor range of compressors are ideal for applications which require quick pressure response like hydel turbine starting, high pressure testing and diesel engine startup.